Finding an 8 passenger SUV these days is simple. Finding a great one that fits the busy family’s everyday needs is not. With a huge range of choices from every vehicle manufacturer around the globe, narrowing it down to just one can be a painstaking endeavor. To that end, here are ten great options to fit any parent’s busy commuting needs, all with room for two adults and six children, or five with a seat for the family dog! 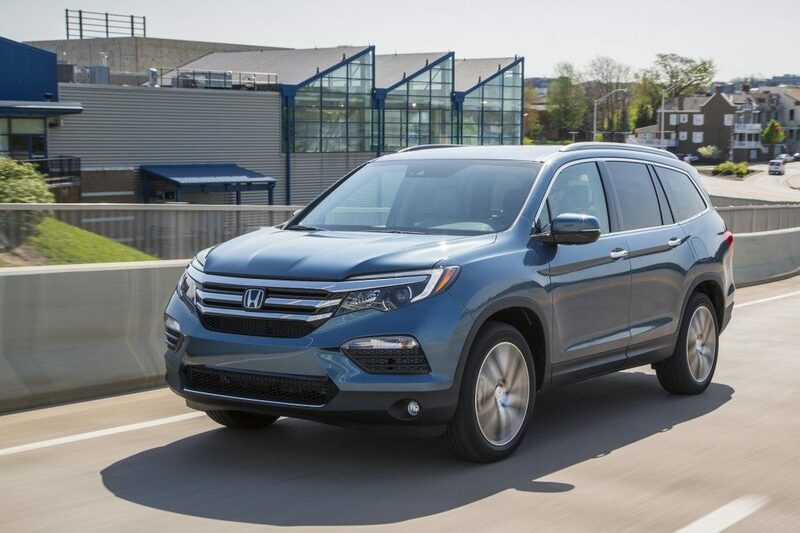 Honda’s 2017 Pilot remains a strong competitor in the SUV market, undergoing minor upgrades to the interior, including more soft-touch surfaces and small exterior tweaks. It’s one of the best people-carriers for 2017 thanks to its strong utility, interior space, and low price tag. The only engine option is the standard V-6 mated to either a 6-speed automatic or a newer 9-speed. The 9-speed automatic works reasonably well but can still get confused while shifting, an issue that most of the newer 9-speed gearboxes suffer from. It can be selected with either FWD or AWD with the AWD powertrain being the clear winner, taking only a minor hit in fuel efficiency compared to the FWD model but gaining increased traction in undesirable weather. 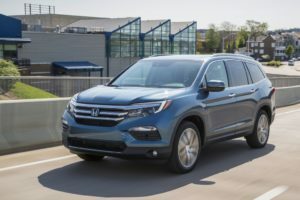 Both the second and third rows will fold down to provide additional cargo space, and the Pilot is one of the few SUVs in its class that give buyers a usable third row. It’s not as spacious as a full-size, but will comfortably seat adults on moderate length trips. Thanks to the folding seats, the Pilot can provide a surplus of cargo space, giving it a significant amount of utility for its size. Toyota’s big Highlander SUV returns for 2017 with even better powertrain options, including an attractive hybrid-electric motor that’s one of the best in its class. 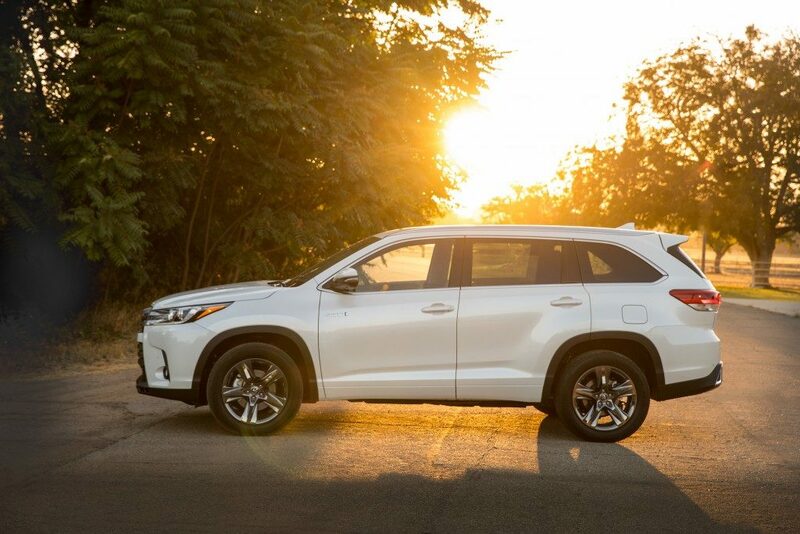 The rugged Highlander chassis benefits from years of proven reliability and makes the Highlander an excellent option for consumers who want a big, reliable SUV. The most popular engine option will be the 3.5L V-6 mated to an 8-speed automatic gearbox. It’s not the standard engine, but it’s worth the additional price to upgrade, as it’s much faster than the standard 4-cylinder and only takes a single combined mpg hit in fuel efficiency. 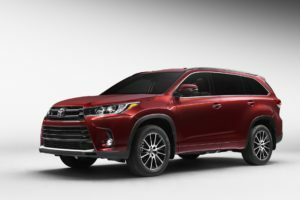 The standard 4-cylinder only produces 185-hp and will feel sluggish when the Highlander is loaded with people or cargo and is restricted to FWD. The V6 can come with FWD or AWD powertrains. The Highlander’s interior is comfortable and stylish without being overly lavish, with lots of high-quality materials and soft-touch surfaces. An adjustable second row provides plenty of leg and headroom for passengers, while the third row can be given adequate leg room when the second row is adjusted to do so. The 2017 Enclave is a big, heavy SUV with plenty of luxury and class to go around. An improved interior will entice consumers looking for a more upscale passenger SUV, allowing its passengers to be transported in comfort and class. A 3.6L V-6 produces 288-hp, more than enough to get the Buick to freeway speeds in adequate time. The standard Enclave comes with FWD, but AWD is available as an option. Both powertrains suffer in the fuel economy department, getting 18 and 17 combined mpg, respectively. The Enclave handles well on the road, with a very quiet and smooth ride, but the front-end will nosedive under heavy braking, making the Enclave feel a bit clunky in some situations. The Enclave’s focus on comfort is readily apparent in its seating, with a usable third row that’s easy to access when compared to some of its rivals. There’s lots of places to plug in various devices throughout the cabin, and second row passengers have seats that are almost as comfortable as the front row. If there’s one downside, it’s in the pricing of the Enclave’s long list of options, which will quickly elevate the Enclave’s price to European luxury territory. One of a family of three large, body-on-frame GM SUVs, the 2017 Tahoe is a full-size with a focus on rugged utility and transport. Intended to take on hefty hauling, towing, and people carrying duties, Chevrolet gives its customers almost limitless customization in the Tahoe’s configuration. A 355-hp 5.3L V-8 sits under the hood of the Tahoe, paired with a 6-speed automatic and equipped with cylinder deactivation technology to help improve fuel economy. The Tahoe can haul up to 8,600 pounds when properly equipped, one of the highest towing ratings in its class. 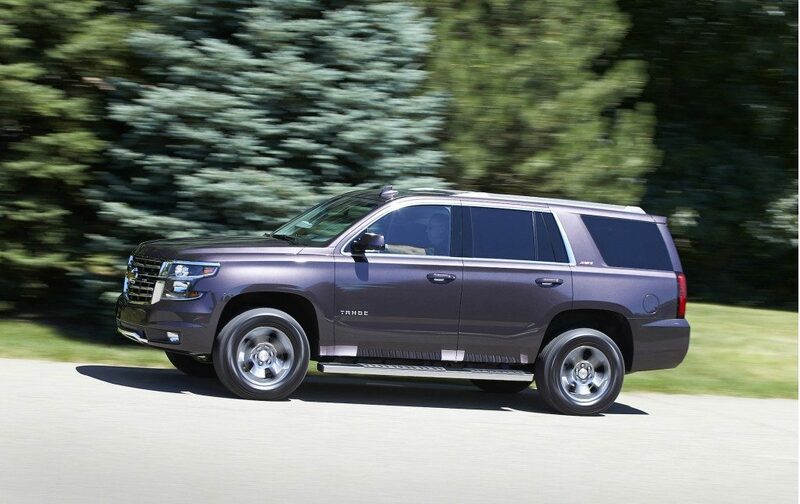 When driven, the Tahoe feels large, but it’s surprisingly nimble and easy to handle. There’s still significant body roll during tight cornering or rapid lane-changes, but it has a smooth and comfortable ride, particularly when equipped with the available Magnetic Ride Control suspension. There’s lots of space in the Tahoe, with ample room in the second row and a usable third row for shorter trips. The second and third rows both fold down and can create a huge amount of cargo space behind the front row seats. Another large GM SUV, the Yukon shares many characteristics of the Tahoe, including the same body-on-frame design and standard engine. It’s available in a wide range of trims and configurations, allowing it to be tailored to be custom fitted with up to nine seats. 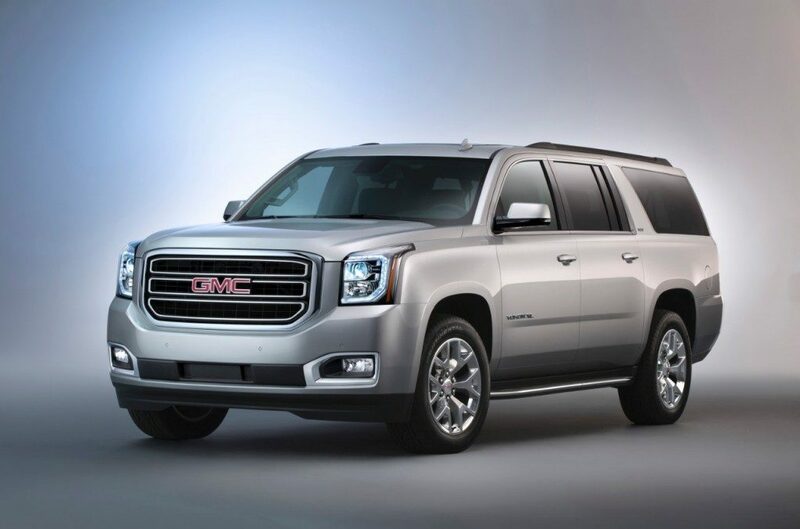 The Yukon stands apart from the Tahoe with the addition of the Denali trim and an XL option, the latter of which extends the Yukon to Suburban length for added third row space. The same 5.3L V-8 is found as the standard Yukon engine, producing the same 355-hp and equipped with GM’s cylinder deactivation technology. When purchased in the Denali trim, that engine gets replaced with an even larger 6.2L V8 that produces a staggering 420-hp. The larger V8 is paired with an 8-speed automatic instead of a 6-speed, and has a towing rating of only 8,300 pounds instead of 8,400. Functionally the standard Yukon is very similar to the Tahoe, with a similar amount of interior space and a slightly more upscale aesthetic. There are more soft-touch surfaces in the standard Yukon than in the standard Tahoe, and the layout is a bit different. It has similar legroom in the third row, except in the XL trim, where both the cargo space and the third row get big gains thanks to the longer chassis. 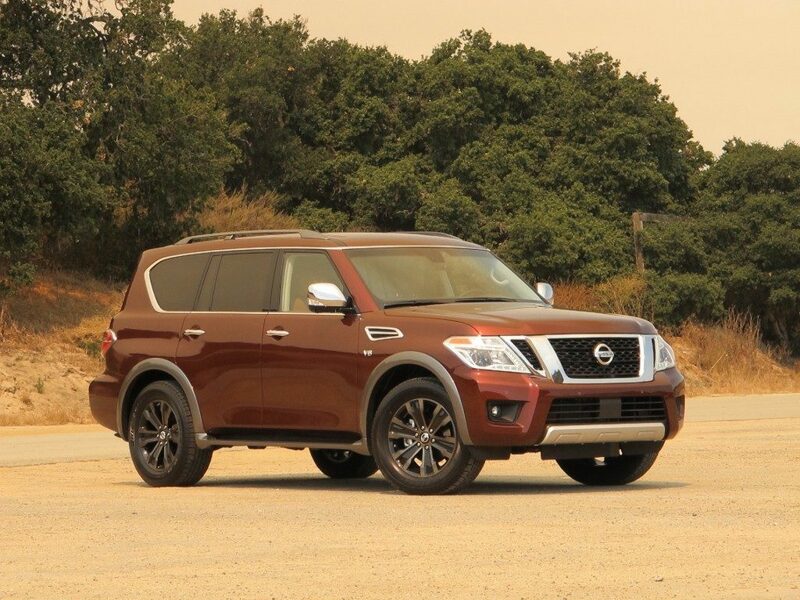 The second-generation of the Nissan Armada is essentially a Pathfinder, using a proven chassis that’s popular around the world as a tough full-size SUV. 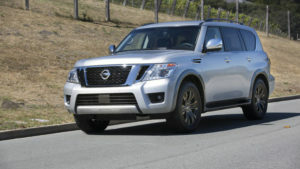 The Armada is Nissan’s answer to the bulky GM vehicles in its class, providing consumers with a big utilitarian SUV option that can haul plenty of cargo and tow up to 8,500 pounds. The Armada’s giant 5.6L V-8 produces 390-hp and trades fuel efficiency for raw power. It gets a paltry 16 combined mpg when selected with RWD, dropping to 15 when configured with 4WD. This V-8 paired with the standard 7-speed automatic feels plenty quick for freeway acceleration, and handles the Armada’s towing capacity with ease. Even when fully laden, the Armada isn’t sluggish or slow. Driving the Armada feels as expected; it’s big, leans in the corners, and can be hard to maneuver in a tight space. That being said, it does have a very quiet and comfortable ride. Acoustic dampening makes being in the Armada’s cabin quiet and serene, with hardly any road noise at all. The second row has plenty of room to seat adults comfortably, but the third row comes up short in both headroom and legroom. Both rows can fold down to allow for additional cargo space. 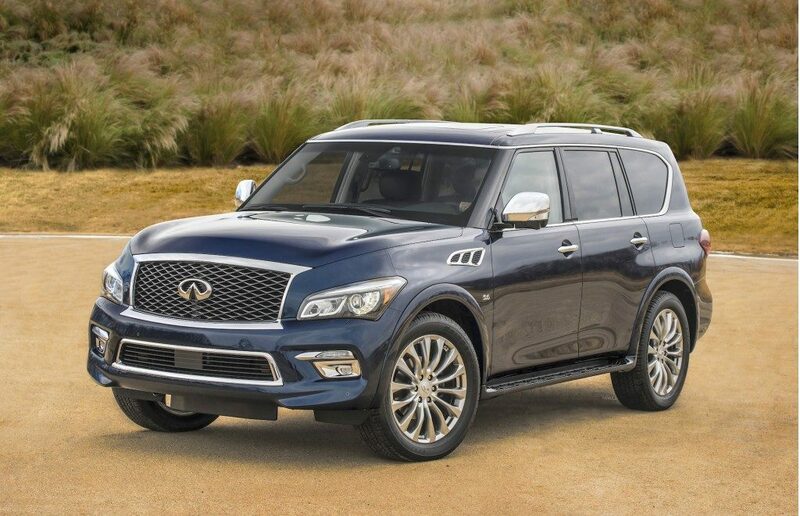 Infiniti QX80 is a full-on luxury SUV designed to comfortably transport eight passengers in the lap of luxury. Its high-quality interior is intended to project a refined, upscale feel without being overtly flashy, with plenty of expensive materials and convenience extras thrown in for good measure. It may look a bit boxy on the outside when compared to other luxury models, but on the inside the QX80 is all class and aesthetic appeal. The QX80 features a powerful 5.6L V-8 paired with a 7-speed automatic that produces 400-hp. It allows the QX80 to be seriously quick when it needs to be, even when fully loaded with passengers or cargo. The handling is a bit clunky, especially when looked at next to some of its more driver-oriented European rivals, but it’s very quiet and smooth even on rough roads. The first and second rows are some of the best found in any SUV, and while the third row isn’t overly spacious, it can be used by adults in a pinch on short trips. The second and third rows can both be lowered with the push of a button to provide additional cargo space. The Tahoe’s bigger, heavier, more expensive older brother, the 2017 Suburban is one of the biggest vehicles on the road. Measuring in at a colossal 220-inches long with a 130-inch wheelbase, the Suburban aims to be one of the most functional consumer SUVs available. The same 5.3L V-8 featured in the other GM vehicles can be found here, producing the same 355-hp coupled with a 6-speed automatic. It’s available in RWD or 4WD configurations, and features cylinder deactivation technology to improve fuel economy. It handles just as big as it feels; there’s body roll when cornering or changing lanes quickly, and despite still being fairly agile, the Suburban can be a pain to park in tight spaces. 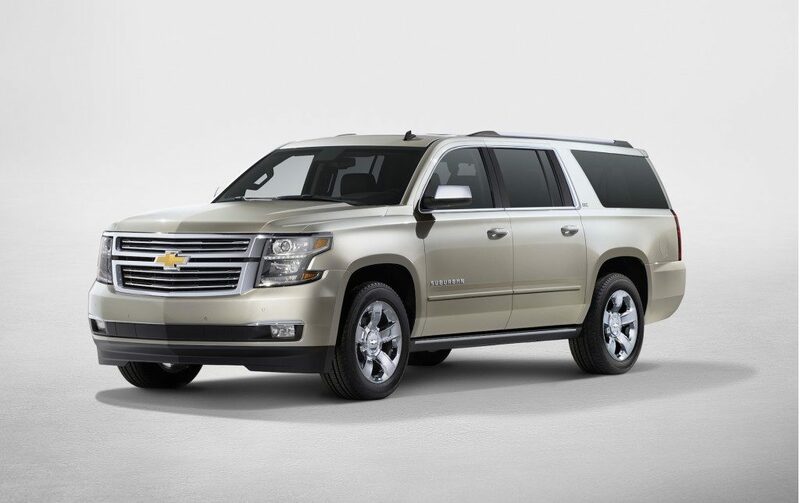 It’s all about size, and the Suburban has one of the largest interior spaces of any SUV. All three rows are usable by adults, and the third row isn’t overly difficult to access, even with a second row bench installed. Both the second and third rows can be folded down to create cargo space that rivals a full size van. Ford’s competitor to Chevrolet’s Suburban, the 2017 Expedition remains true to its SUV roots, giving off a distinctly old-school SUV exterior aesthetic and rugged underpinnings intended to haul the most cargo, tow the biggest boats, and comfortably seat the most people. An all new twin-turbo 3.5L V-6 coupled to a 6-speed automatic gearbox powers the Expedition, and it’s clearly a smart choice by Ford. This V-6 gets a respectable combined 21 mpg for RWD models, while still producing 365-hp and somehow getting a 0-60 time of less than six seconds. That’s unbelievably quick for a full-size SUV. The Expedition is available in both a standard trim and an EL edition, and both offer 4WD as an option. The Expedition handles like a much smaller vehicle, except when being parked, when the enormous length and width quickly become apparent. A note on size: the Expedition is even larger than the GM family full-size SUVs. When selected in the EL trim it has a 131-inch wheelbase and 221-inch length, giving it even more interior space for easier third row accessibility, seating, and cargo capacity. Both back rows fold down to create additional cargo space. Filling the role of a much-needed inexpensive full-size SUV, the Chevrolet Traverse is cheap, but still nearly the size of Chevrolet’s Tahoe. It has less power than some of the more expensive full-size on this list, but hits all the ride notes as a people hauler, including the ability to tow up to 5,200 pounds in the AWD powertrain. 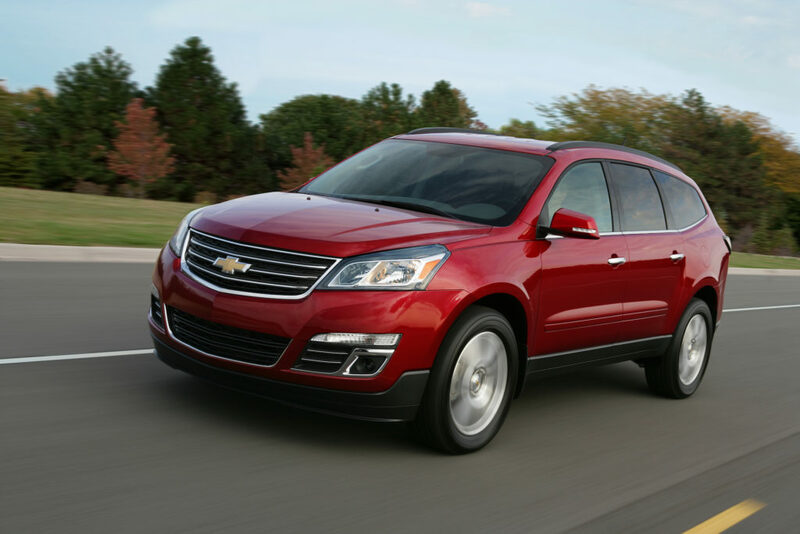 The Traverse features a decidedly average 3.6L V-6 and a 6-speed automatic gearbox. It comes with either FWD or AWD and produces 288-hp. Despite being almost as large as the Yukon and Tahoe, the Traverse handles handles much better than either vehicle. It’s not as quick, but corners better and has a more smooth and even ride than its distant cousins. 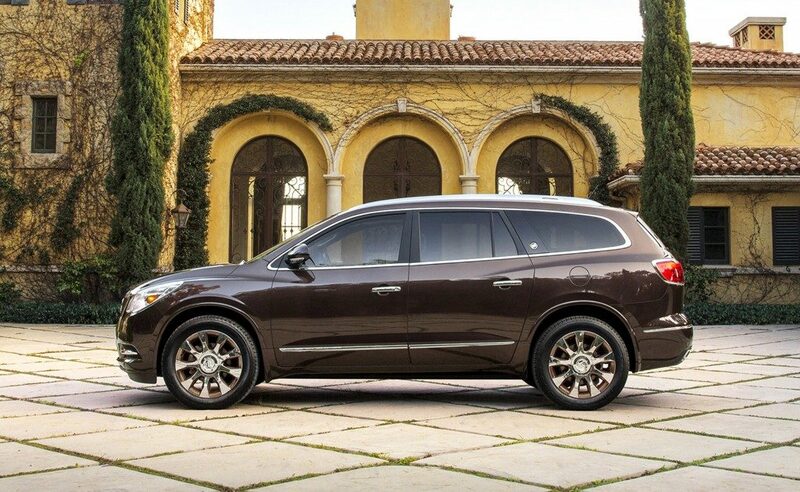 Thanks to an adjustable second row seat, the Traverse can fit adults into the third row on shorter trips. It’s not going to be overly comfortable, and is best left for kids and teens, but it’s still usable. The third row can also be difficult to access for larger adults.